I loved and hated this recipe. The taste was great but the fussiness of fudge almost had me chucking it in the trash before I had it all cut up. The recipe had been reviewed as oh-so-easy as it was made in the microwave. That should have been my first red flag. I had read that it could be hard to cut through the gumdrops in this fudge and I thought to myself, oh really how hard could it be? Pretty damn hard is the answer. In the picture above you may notice a piece of fudge that has a white piece in it. To clarify, that is not a white chocolate chip, it is a piece of gumdrop. I bought a box that had red and green tops with white bottoms. Not only was it pretty hard to cut, which by the way required washing my knife after every single cut to get a clean cut, it was also pretty hard to get it to release from the tin foil. The consistency even after refrigerating overnight was extremely soft. After cutting the fudge I dropped the pieces into small paper liners and let them sit on the counter. After several hours uncovered they had lost their stickiness and were able to be picked up and eaten. So in the end, I was wishing I had gone with my tried and true Creamy Dreamy Fudge instead of the fussy gumdrop. The good news was that even though it was a giant pain, the fudge was well received and loved by all the kiddos. 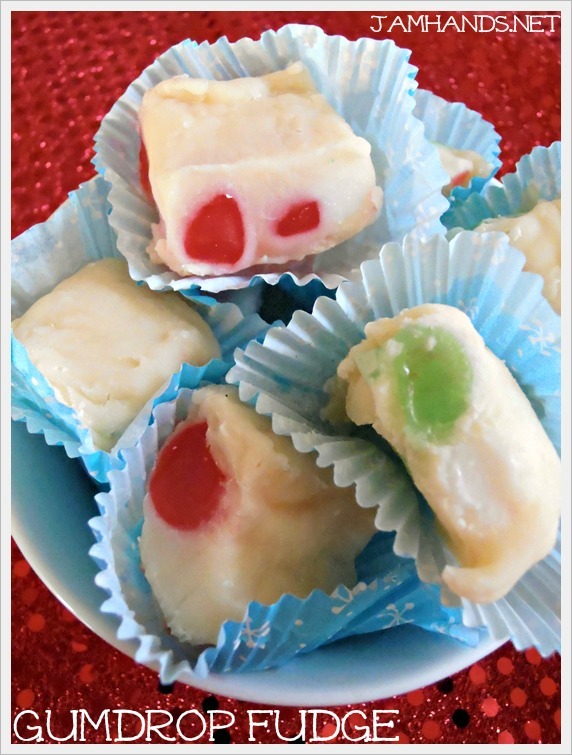 I think if I ever try this again I will go with a different recipe that is more of a traditional cook on the stove top style of fudge like the one posted at Shugary Sweets. The consistency of that fudge looks much better my microwave version. Anyhow, live and learn! For those brave enough to try, the recipe follows. 1. Line a 9-in. square pan with foil; set aside. In a microwave safe bowl combine the chocolate chips, milk and salt and microwave in 30 seconds intervals until melted. Stir in vanilla and gumdrops. 2. Spread into prepared pan. Cover and refrigerate until firm. Using foil, remove fudge from the pan; cut into 1-in. squares. Store in an airtight container at room temperature. Sounds like a treat my son would love. I make, microwave fudge and it sets up hard, however I use 1 1/2 lbs of chocolate and have never had a problem with the fudge being sticky. I use a large (12 inch) chefs knife to cut the fudge into squares.